Senior Enlisted Advisor to the Chairman of the Joint Chiefs of Staff (SEAC) is a military position within the United States Department of Defense and is the most senior noncommissioned or petty officer overall in the United States Armed Forces. The SEAC is appointed by the Chairman of the Joint Chiefs of Staff to serve as a spokesperson to address the issues of enlisted personnel to the highest positions in the Department of Defense. As such, the SEAC is the senior enlisted advisor to the Chairman of the Joint Chiefs of Staff, and serves at the pleasure of the Secretary of Defense. The SEAC's exact duties vary, depending on the Chairman, though he generally devotes much time traveling throughout the Department of Defense observing training and communicating to service members and their families. The normal tour of assignment is four years, which runs concurrently with the Chairman. The first member to hold this post was William Gainey. On 11 December 2015, the Chairman of the Joint Chiefs of Staff, General Joseph Dunford, administered the Oath of Office to CSM John W. Troxell, USA. Troxell became the third member and second soldier to hold the office. Although Army and Marine headquarters from battalions and regiments, up to divisions, to corps, army headquarters and higher, have traditionally each had a sergeant major; and Navy and Coast Guard vessels have traditionally each had a Command Master Chief or chief of the boat; the services' national headquarters generally had no counterpart position. The Marine Corps was the exception, having a Sergeant Major from 1801 until 1946, and a Sergeant Major of the Marine Corps from 23 May 1957 onwards, as the senior enlisted advisor to the Commandant of the Marine Corps. The other services followed during the Vietnam War, creating the counterpart positions of Sergeant Major of the Army in 1966, Master Chief Petty Officer of the Navy and Chief Master Sergeant of the Air Force in 1967, and Master Chief Petty Officer of the Coast Guard in 1969. The positions are generically or collectively referred to as "senior enlisted advisors" ("SEAs"). Only one Soldier, Sailor, Marine, Airman and Coast Guardsman can hold that rank at any one time (although they also hold the rank upon retirement per 10 USC § 1406(i)(1); moreover, the position's singularity is not deemed to prevent the technical overlap of a few weeks while a recently "retired" SEA remains legally on active duty for the duration of his accrued back-leave, known as "transitional leave"). Each advises his or her service chief (Chief of Staff of the Army, Commandant of the Marine Corps, Chief of Naval Operations, Chief of Staff of the Air Force, and Commandant of the Coast Guard) and other senior service leaders on all enlisted matters, makes decisions affecting enlisted personnel and their families, and is often invited to testify before Congress. The position of Senior Enlisted Advisor to the Chairman was created in 2005 under General Peter Pace. The newly created position was established to advise the Chairman on all matters involving enlisted personnel in a joint environment. When Admiral Michael Mullen became Chairman of the Joint Chiefs of Staff, he consulted the SEAs of the services and opted not to appoint an SEA in his own office. His office's press release stated that this was not a reflection on General Pace, merely that he did not feel the office was required. The position was reinstated in 2011 by Mullen's successor, General Martin Dempsey. Command Sergeant Major William Gainey, USA, 1st Senior Enlisted Advisor to the Chairman (October 1, 2005 – April 25, 2008). General Peter Pace selected Army Command Sergeant Major William Gainey to serve as the first Senior Enlisted Advisor to the Chairman ("SEAC"), beginning 1 October 2005. Gainey had more than 30 years of active-duty experience including an extensive background in joint operations. He had most recently served as the command sergeant major of III Corps and Fort Hood, Texas, from 9 May 2003 until 30 September 2005. He served as Senior Enlisted Advisor to the Chairman until he retired on 25 April 2008. Sergeant Major Bryan B. Battaglia, USMC, 2nd Senior Enlisted Advisor to the Chairman (October 1, 2011 – December 11, 2015). General Martin Dempsey selected United States Marine Corps Sergeant Major Bryan B. Battaglia to serve as the 2nd Senior Enlisted Advisor to the Chairman, Joint Chiefs of Staff. He took his post on 1 October 2011. Battaglia had more than 36 years of service at all levels including multiple combat deployments and senior enlisted assignments. He served as Senior Enlisted Advisor to the Chairman until 11 December, 2015 and officially retired on 31 August, 2016. The SEAC has oversight in any area that the Chairman assigns him. The SEAC is the spokesman of the Chairman to all services' SEAs. The SEAC, in some cases, is the spokesman for all enlisted members of the services and combatant commands during meetings with leaders from the services, civilian community, and service leaders of other nations. The SEAC is not in the direct chain of command of the services' nor combatant commands' SEAs; however, he is in the NCO communication chain. The SEAC is the Chairman's link to and/or from the services' and combatant commands' SEAs. During visits to areas of operation, the SEAC identifies issues and problems that might affect the services as a whole. When a problem is identified, he works with the services to find a common solution and help integrate, if possible, the solution into all of the services. Recently, combatant commands, which is joint duty and does contain enlisted members from various services, have created Senior Enlisted Advisor (SEA) positions. The SEAC is an advisor to the Chairman on all matters concerning joint and combined total force integration, utilization, and development. Additionally, the SEAC helps develop NCO-related joint professional education, enhance utilisation of senior NCOs on joint battle staffs, and support the Chairman’s responsibilities as directed. In carrying out the functions, roles, duties, and responsibilities, the SEAC, as appropriate, consults with and seek the advice of the services' and combatant commands' SEAs on all issues pertaining to joint service members. The SEAC convenes regular meetings with the services' and combatant commands' SEAs. When the SEAC is a soldier, he wears a unique collar insignia featuring the shield portion of the insignia of an aide-de-camp to the Chairman of the Joint Chiefs (less the surmounting eagle), placed upon a gold-colored Army enlisted collar disk, one inch in diameter; the collar brass is also worn in place of distinctive unit insignia on his beret, garrison cap, and pull-over sweater, in the same manner as the Sergeant Major of the Army wears his unique collar brass. This insignia is in keeping with the collar devices of U.S. Army enlisted soldiers, and is patterned directly upon that of the Sergeant Major of the Army. Although the Army approved the Joint Chiefs of Staff's request for unique collar insignia for the SEAC on 20 December 2005, the same memorandum rejected unique rank insignia, and CSM Gainey continued to use the rank title/acronym of a Command Sergeant Major (despite receiving the special SEA pay rate). When the SEAC is from the Army, the Army SEA wears theoretically inferior rank insignia and has a nominally inferior rank titles/acronyms similar to that of the individual services' SEAs. No decision has been made as to whether future SEACs will wear a unique rank insignia. Sergeant Major Battaglia, continued to wear the standard Marine Corps Sergeant Major insignia during his tenure as the 2nd SEAC. The Sergeant Major of the Army, Chief Master Sergeant of the Air Force and the Senior Enlisted Advisor to the JCS Chairman are the only enlisted members of the United States armed forces, below general/admiral grade, to be authorized a positional color (flag). 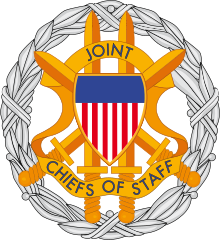 The SEAC's positional color is based upon those of the Chairman of the Joint Chiefs of Staff, and the Sergeant Major of the Army. The central element of the color is a rendering of the SEAC collar insignia, less the surrounding disk, with the eagle shown in proper colors (rather than simply gold as on the collar insignia). The diagonal line separating the blue in the upper right from the white in the lower left is continued to the corners of the flag. Despite the unique duties and protocol position of this position, the Senior Enlisted Advisor to the Chairman remains a non-commissioned officer and, as such, is obliged to render salute to all commissioned officers and warrant officers. The Senior Enlisted Advisor to the Chairman and the other five SEAs hold pay grade E-9, as all sergeants major and command sergeants major, Command Master Chief Petty Officers and Command Chief Master Sergeants; however, in accordance with 37 U.S.C. § 1009, Schedule 8, an SEAC's base pay is $7,489.80 per month ($89,877.60 per year), regardless of the incumbent's service longevity. For comparison, any other E-9, even with the maximum forty years of service, would receive $7,195.80 per month. In addition to his base pay and normal tax-free allowances, the SEAC and the other SEAs are each entitled to a special tax-free allowance of US$2,000.00 per annum, in accordance with 37 U.S.C. § 414(c). ^ The position remained vacant from April 25, 2008, to October 1, 2011. Wikimedia Commons has media related to Senior Enlisted Advisor to the Chairman. ^ Marine Corps Legacy Museum. ^ Army Planner Colonel James J. Spinnel, in the Assistant Deputy to the Army Operations Deputy (Joint Affairs), to the Office of the Chairman of the Joint Staff, 20 Dec. 2005. ^ "File:SgtMaj Bryan Battaglia, Senior Enlisted Advisor to the Chairman of the Joint Chiefs of Staff.jpg". Wikipedia. ^ "SEAC Heraldry" (PDF). United States Army Institute of Heraldry. 4 November 2005. Pace Selects Army Tanker as First JCS Senior Enlisted Adviser. Dunford selects UNC/CFC/USFK senior enlisted leader as Third SEAC.